Nov 25, 2016 | eNews Etc. 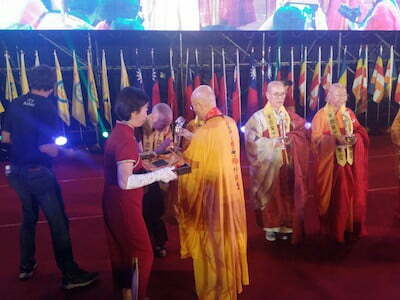 Taiwanese news reports that fifteen thousand people attended the Global Bhikkhuni Award ceremony in Taiwan, where Abbey founder Venerable Bhikshuni Thubten Chodron joined 50 distinguished nuns from 12 countries to receive the award. A bhikkhuni (bhikshuni in Sanskrit) is a fully ordained nun. 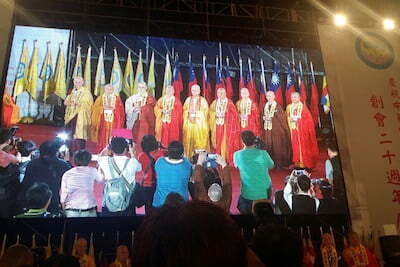 The Chinese Buddhist Bhikkhuni Association (CBBA) of Taiwan inaugurated the Global Bhikkhuni Award to recognize outstanding nuns for their work in spreading Buddha’s teachings. 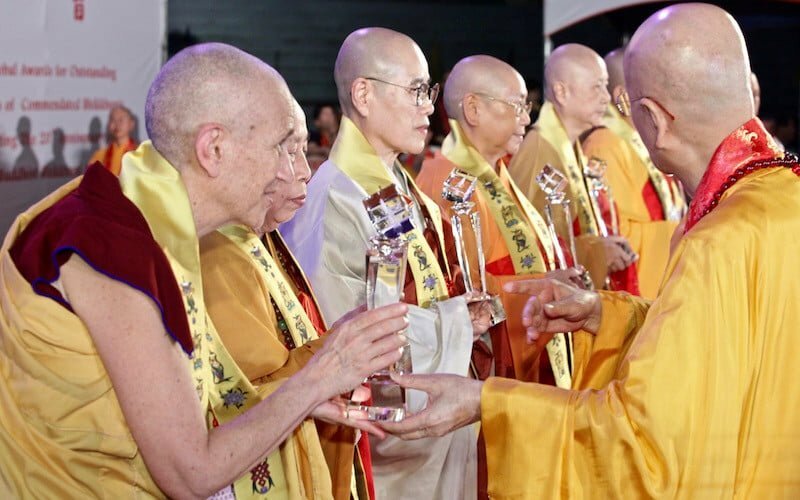 “I am honored to accept this award from the Chinese Buddhist Bhiksuni Association because anything I’ve done to benefit living beings has been due to the kindness of my teachers, beginning with the Buddha, continuing with the lineages of Dharma and Vinaya masters, and culminating with my sramaneri preceptor Kyabje Ling Rinpoche and my bhiksuni preceptor Venerable Master Bai Sheng. 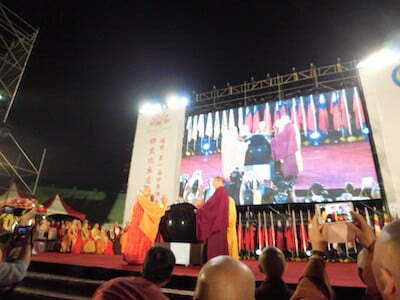 “I would also like to show my respect and appreciation to Venerable Master Wu Yin, Ven. Ben Yin, Ven. Mingjia, Ven. Heng-ching, Ven. 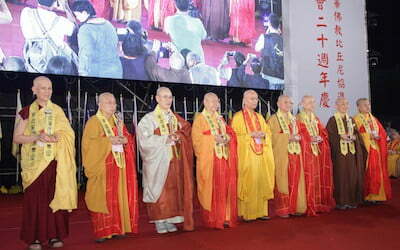 Jendy Shih, and other Chinese bhiksunis who have been instrumental in educating Western bhiksunis in the Vinaya and in establishing Sravasti Abbey, the only training monastery for Western monastics in the Tibetan Buddhist tradition in America. While our practice tradition at Sravasti Abbey is Tibetan Buddhism, our Vinaya lineage is from Chinese Buddhism. “The bhiksuni ordination is not available in the Tibetan tradition because the ordination lineage never spread to Tibet. I am grateful to Chinese Buddhists for sharing this precious ordination with qualified Western aspirants so that we, too, can become full members of the sangha and help shoulder the responsibility of preserving the Dharma and Vinaya for future generations. It is with this thought that I humbly accept the award. A video of this short talk is on our YouTube Channel. See the video of Ven.Chodron’s life and work, made especially for the award ceremony, below.You can also see photos of the Global Bhikkhuni Award Ceremony, and you’ll find many more on the Thubten Chodron Facebook page. Press coverage was extensive in Taiwan. We will post English translations when we have them. Meanwhile, you can see reports (in Mandarin) from the Fo Guang Shan news network, Tzu Chi Foundation, and the China Times newspaper.